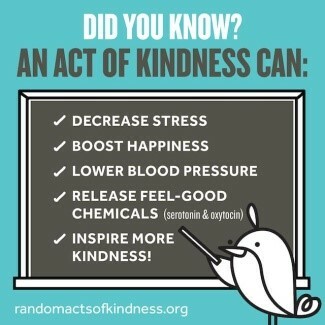 Did you know that random acts of kindness might actually be good for your well-being! Kindness is a habit of giving that is expressed when we do something for others as an act of good will. Compassion is at the heart of kindness and puts the needs of another person before our own. Did you know that random acts of kindness could decrease stress, lower blood pressures and help us feel good? Small things like letting someone go ahead of you in a grocery line, or picking up the phone to check on an elderly neighbor, even smiling at a passerby can release “feel good chemicals” like Serotonin and Oxytocin in the brain that boost our mood. Compassion for others is at the heart of most faith traditions so performing acts of kindness help us feel we are doing the “right thing.” Feelings of gratitude come from acts of kindness as we become aware of the goodness in our lives. Kindness also leads to happiness and a feeling of being with others. Feeling connected brings us into community with others and gives us a sense of belonging. Practicing random acts of kindness helps both the giver and the receiver to feel better and causes a ripple effect of more acts of kindness. Even seeing someone being kind to another can encourage us to be more kind to someone during our day. During Random Kindness week, February 11-17, see what you can do to spread kindness in your home, community and the world. Be a part of creating positive feelings, building relationships and spreading the good will of kindness. You probably noticed that Random Kindness Week includes Valentine’s Day, the day of love. How can you spread love beyond roses and chocolate?